Any space can feel smaller if it is not organized properly. 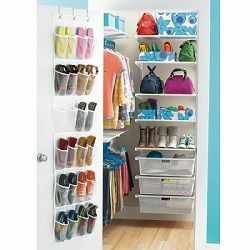 Especially for the closet, people often feel it is cramped no matter what the dimensions were before it was stuffed with all kinds of articles. For instance, people often put shoes, bags, gloves together to save the space. But they got the contrary effect. I tailored down 5 practical and easy to do ways for you. You may have a view if your closet is often in a mess state. Hooks are good help for the small items such as gloves, scarves and ties etc. install a few hooks in the closet at eye level to hang those small items so that they will not mix in the middle of the closet. This idea is very helpful. It not only avoids the small stuffs dropping to the floor, bur also frees up the closet space and keeps the items easy to pick out. Sometimes, your closet is well organized. Because of the shortage of time or emergency condition, you get the clothes out in a hurry mood so that you would not think of the organization. As a result, all the items in it are in a mess. To avoid this condition, the lighting may help you. Illuminate the closet with lights not only makes the space clear and obvious, but also you can see what’s inside the closet during the night. For another reason why the closet is often in a mess state is that all the categories are together. Sometimes, you just need one thing. But to get the one thing out, you have to move other items away to find the one thing. Why not put the same item in a box or container. You may put a several box for putting small items such as underwear, bra and socks to different box and label them with names. First for the cloth racks, when you get items out of it, do not forget to put the empty one to the hanger category. Make sure that no space is wasted in the small closet. Second, after washing, put every item to the original place so that everything will be in order. At last, if the items you will not use them anymore, do not hesitant to throw them away or donate to someone else. If you put them in the closet, it not only makes the space crowded, but also posits rubbish for no good. If you have more smart ideas about this topic, you may contact us at www.melodyhome.com.